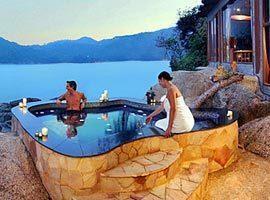 Resorts offering accommodation with your own pool is all the rage. 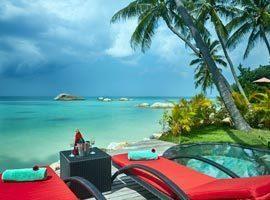 Especially when we're talking an island escape to this paradise the benefits are obvious. Sipping champagne while soaking in seclusion with views over exotic panoramas is romantic and if you are staying with children it will keep them happily occupied where it is easy for you to keep an eye and relax simultaneously. 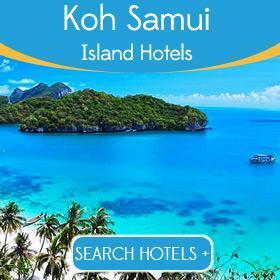 In Koh Phangan private pool villas are found at luxury resorts most located on quiet and sometimes private beaches. Compared to many other destinations in Thailand, this island retains an original tropical charm with a rural feel and all beaches, except for Haadrin where monthly full moon parties takes place, are tranquil and relaxed, some are secluded and all are pristine clean. It is therefore the ideal destination to escape a westernized commercial scene and find hotels with private pools offering the opportunity to enjoy barefoot beach luxury in villas that blend rather than intrude on the exquisite nature. Cascading down a hill few other resorts in Koh Phangan so masterfully blend rustic luxury with an tropical outdoor lifestyle. You can choose a villa on the hill surrounded by plants and trees for extra privacy or directly on the beach. Located on Baan Tai Beach Chantaramas offers convenient access to 2 vibrant villages with narrow streets lined with restaurants and bars. Yet, cocooned in a tropical garden its setting is utterly tranquil. 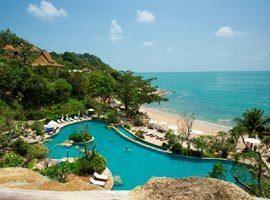 Located on the north west coast the sunset views are breathtaking and you are near Tong Sala Village. Kupu Kupu features its own boat to take you on scenic cruises and its rooms evoke a romantic atmosphere, many with a seafront location. Panviman is located in Tong Nai Bay on the east coast which is in our opinion the most beautiful, unspoiled beach on the island. 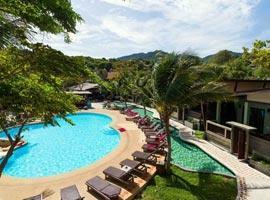 It offers undisturbed relaxation while vibrant Haadrin or Banthai Village can be reached within 15 minutes. Villas at Santhiya are all built from teak wood in traditional Thai style. 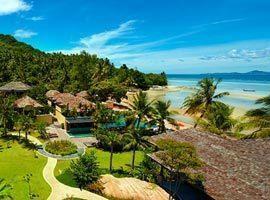 It overlooks a crystal clear bay and spoils guests with a private beach. 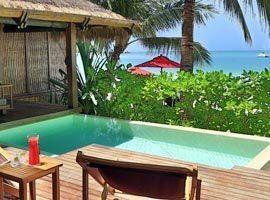 Its Royal Grand Pool Villa Suite offer 2 bedroom accommodation with a separate living and peerless views. To stay in affordable luxury on a tranquil beach while being walking distance of the monthly full moon party and vibrant Haadrin Village where winding alleys are jam packed with curio shops, restaurants and bars, Cocohut is unbeatable.